ALL Allegiant Air and Via Air flights now ARRIVE and DEPART from the South Terminal at Austin-Bergstrom International Airport! Onsite parking is available and only $10 per day! Accessible from US 183 South and Burleson Road. Be sure to map your route to the South Terminal! The newly remodeled South Terminal is separate from the Austin-Bergstrom International Airport and can be accessed by taking 183 to Burleson Road. You’ll find over 1000 parking spaces within walking distance of the terminal. 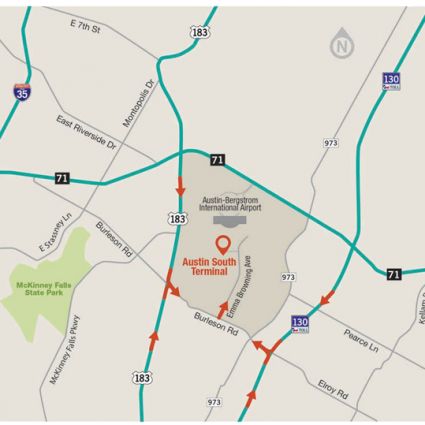 The South Terminal has a separate entrance on the south side of Austin-Bergstrom International Airport and is not accessible from inside the Barbara Jordan Terminal or from SH 71.